2016 is shaping up to be the year of health insanity. Multiple family members are struggling with one thing or another (who can forget my dad starting 2016 in ICU trauma after a ladder fall? ), and of course, family must stick together: a recent routine ENT checkup revealed the unwelcome surprise that my cholesteatoma had returned. Lots of apology and sympathy from the doctors. They know it's not fun. They know nobody wants four surgeries. They know that recurrence is extremely rare in cases like mine (I've almost accepted the fact that worst case scenario, no matter how unlikely, will always be the case for me). Still, it had to be done, so off to the OR I was whisked yet again on Monday. It takes a village. It seems a little excessive to have multiple people waiting for you when only one is required, but having two (or three) family members with you makes things easier for both you and them (they need a break, too!). I've always had at least Sean and my MIL around post-op, and often one is off trying to fetch a nurse (more ice, please!) while the other is keeping me comfortable company. Get the early appointment. You know how they tell you to get the first AM or first post-lunch visit at the doctor's office to avoid extra waiting time? The same goes for surgery. My first surgery was scheduled for early afternoon and ended up being delayed 4+ hours (and remember, you can't eat all day!). When surgery went longer than expected, things ended late enough that the doctor had me admitted overnight. Not fun for me or my wallet. If possible, always try to schedule a morning procdure. Know your history. 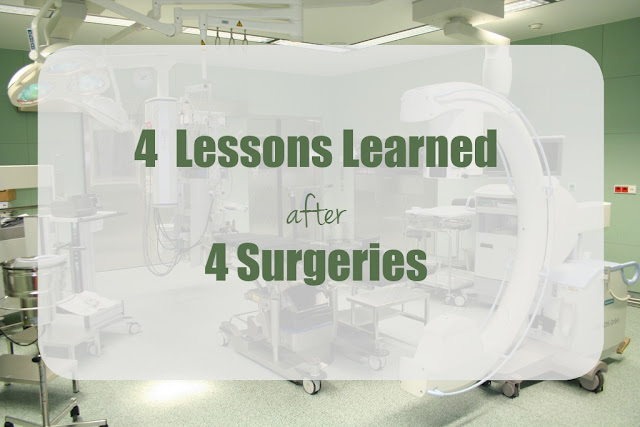 I wouldn't wish multiple surgeries on anyone, but should you have the need, it is important to remember details from each to make things better in the future. I mentioned to my MIL how bad the anesthesia made me feel after surgery #3, and she immediately told me to tell the doctors pre-op so they could use something different. If you can make things more bearable by remembering these details and discussing them, do it! Dress comfortably. Don't try to be cute. Arrive clean (always shower before, you may have to keep some areas dry for some time after) and comfortable. I usually arrive in flip-flops and a sundress so that getting dressed to go home post-op is as quick and easy as possible. I hope recovery is going OK! Aww, I'm sorry you've had to go through this--hope the recovery goes as smoothly as possible for you! As someone who has had major surgery I can agree. These are great tips. Hugs and speedy recovery so we can fun it up in June.